Ferrets are playful and very active pets. The owners know how ferrets find everything very intriguing and start playing with it. The best part about having a ferret as your pet is that they take up a tiny room and easy to maintain comparatively. Ferrets can be trained like dogs to sit, shake the hand, play, etc. If you are looking for a complete guide on how to train your ferrets, then you are reading the right article, my friend. I am going to describe various tasks for which you can teach your ferret. 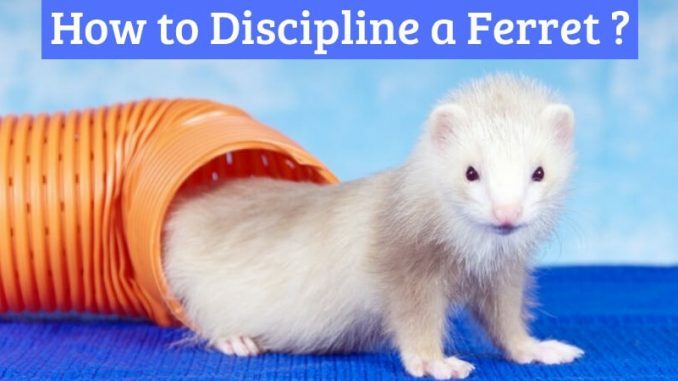 How to Discipline a Ferret? Place the treat or the toy at a distance and try calling your ferret near you. Keep your hand in front of your ferret when it comes near you and just when it lifts the paws to go near the treat, shake it and then give the treat. This will make your ferret understand that he will get a treat if he shakes the hand and does it for some weeks to train your ferret. Make a noise of the squishy toy and start calling their name along with it. When the ferret listens to it, he will come to you for the toy. You can hand over the toy once it succeeds in coming near you when you call out their name. You can decrease the intensity of the noise of the toy everytime to train them. This will signal them to hear your voice and come to you to get the toy. Gradually you can train them such that they listen to your voice and come to you after eliminating the sound of the squishy toys. This process will take 2-3 weeks, make sure that you reward your ferret each time he comes to you after listening to the voice. Hold a treat in your hand higher than the ferret’s reach. Lower the treat but not that much that the ferret can reach it. Keep lowering the treat and say word “Sit” clearly and loudly. Lower the treat but don’t give it till the ferret sits down and keep repeating the command. Once the ferret sits down, give the treat and show some love to them. Don’t be harsh on ferrets ever this process of training them will take weeks and patience. To teach your ferrets for littering in the litterbox, you have to keep your ferrets in your cage because ferrets don’t like to live in dirty surroundings and will not litter in the cage. You can show them the litter box each morning after they wake up and place the ferret in it so that it can litter. 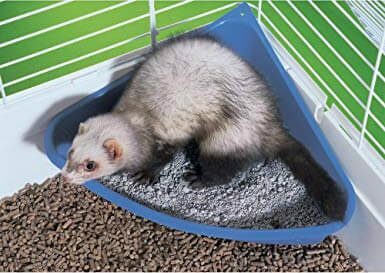 Everytime your ferret starts littering place the ferret in the litterbox this way the ferret will understand that the ferret is supposed to litter in the litterbox. You can also keep the beddings or mats on the place where your ferret usually comes and litters to discourage them from littering there. When you notice your ferret going to the litter box on their own for littering you can reward them with the treat and also cuddle them to encourage them doing it frequently. You can discourage the bad behavior of your ferret by using the command “No” to make them understand that they are doing something wrong. For teaching your ferrets this command, you will need a lot of practice and time. You can start training them when you see them biting your finger you can start by saying “NO” clearly and loudly. And keep saying it and keep them away on the floor after taking out the finger from their mouth. Generally, ferrets are very playful and like being around the owners. If they do something like putting something dirty in their mouth, you can again command no and put them away from you. If you keep doing this to your ferret, they will understand the pattern that the command. No means not to do that activity and restrict it, or they will be kept away. Remember always to motivate your ferrets to keep up the good behavior by giving them the treats and playing with them for a while as they love their humans when they play with them. Don’t be harsh or angry when your ferret doesn’t listen to your commands initially, teach them with patience and love.